Active in sports for as long as he can remember, Dr. Jason Price has always maintained a keen interest in fitness and health. When a back injury occurred at the age of 15, it was the subsequent chiropractic treatment he received that fuelled his motivation to pursue chiropractic as a career. 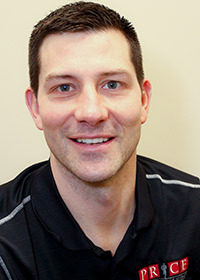 Dr. Price graduated from the University of Western Ontario with a degree in Kinesiology in 1998 and continued on to earn his Doctor of Chiropractic (D.C.) in 2002 from New York Chiropractic College (NYCC). Dr. Jason is also certified in Contemporary Medical Acupuncture, Active Release Techniques (ART), Strength and Conditioning, Selective Functional Movement Assessments, KONKUSSION baseline testing and Concussion Management. Dr. Jason founded Price Chiropractic & Fitness in 2003 with the vision of creating a centre that would guide people from all walks of life (from the stay-at-home mom to elite athlete) to optimal health. Proudly celebrating 15 years in practice, Dr. Jason continues to inspire his community to move, feel and be their best. As a long time resident of Waterloo Region, Dr. Jason has made community outreach an important part of his mission. Dr. Jason has volunteered as part of a medical team for three Ironman triathalons, as well as for the Ontario Summer Games. He is a coach for his son’s AAA Kitchener Panthers Ball team and has coached for WMHA, KMHA and KWBHA. With such a diverse background and developed skill set, Dr. Jason is able to administer effective integrated treatment and therapy with confidence. He can assist in areas of pain management, acute injury care, concussions, post-surgery rehabilitation, and functional training/rehabilitation. Dr. Jason’s knowledge in the fitness arena also allows him to support people in their pursuit of fitness, flexibility, stress management and sport-specific training. In his personal time, Dr. Jason is dad to four active boys. He enjoys playing recreational sports and coaching his boys sports teams. He also feeds his competitive spirit by participating in local road races and pick up hockey. When asked about his ultimate career goal, Dr. Jason says that he simply wants to help people feel better by guiding them to a healthy lifestyle through education, manual treatment, nutrition and exercise. I have been a patient for a number of years and have gone in for maintenance as well as emergencies. I have Lyme disease so it is especially important for me to be able to have a clinic that understands my emergency needs as well as my regular individual issues. They are professional, friendly, helpful and reliable in how they treat me and in their expertise as healers. They have used many different techniques such as physiotherapy, electronic stimulus and others. I appreciate being able to tap into a resource so centred on total body health and concern for the individual needs of their clients. They have even phoned me at home to check on me and see how I was doing, which touched me greatly. I recommend you all to anyone looking for peace of mind in their circle of health care providers.- W.W.